How do I adjust my transfer speeds and bandwidth? Sync allows you to adjust your transfer speeds and bandwidth. 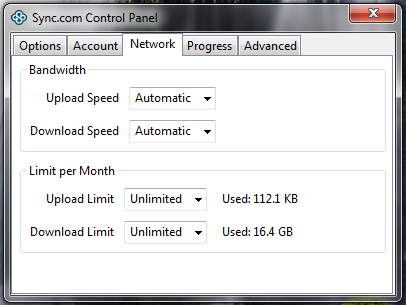 By default, the bandwidth for both upload and download speed it set to 5 MB/s with no monthly limit. Adjust the Bandwidth speed as well as the limit per month. This Limit ensures you don’t go over your usage per month with your internet provider.